Melgarejo is the name to look out for among leading extra virgin olive oils from Jaen in the Spanish region of Andalucia. This oil has just won one of the top awards in the Mario Solinas Awards organised by the International Olive Council in Madrid. The oil is pressed from the local Picual olive and is redolent of tomatoes, herbs and nuts. Here are some recipes developed using this very special oil. 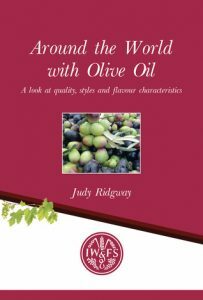 For more recipes using top quality extra virgin olive oils see my book “Remarkable Recipes from the people who really know about extra virgin olive oil – the producers”. This attractive dish makes an excellent light first course, particularly in the summer. If you do not like salt cod or do not want to have to prepare it, use any lightly poached white fish. Wash, dry and grate the peel from the orange and keep on one side. Peel the orange and cut into slices. Place in a deep bowl. Pour any running juice over the grated zest and add plenty of olive oil. Whisk all together and pour over the oranges. 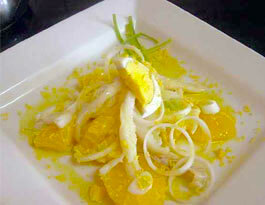 Cut the fish into strips and arrange on top of the oranges with the onions and hard boiled eggs. Serve at once. This is another very popular Spanish summer starter. It is really refreshing on a hot day. Place the crumbs in some cold water to soak. Squeeze dry. Grind the almonds with the cloves, the wet crumbs, vinegar, and some salt to make a white paste. Add extra virgin olive oil little by little and whip all together. At the end add water slowly to make a fine cream. Chill and serve very cold. This recipe can be made well in advance as the dish will keep in the fridge for two pr three days provided that the fish is well covered by the marinade. Wash the vegetables and cut into julienne strips. Place in a large earthernware dish with the unpeeled garlic, bay leaves, peppercorns and cloves. Cover with the oil, vinegar and stock and bring to the boil. When it has boiled for five minutes, carefully add the salmon steaks. Bring back to the boil and cook the salmon for 1minute. Remove from the heat, cover and leave to cool. Store in the fridge and serve when convenient with a cold potato salad. 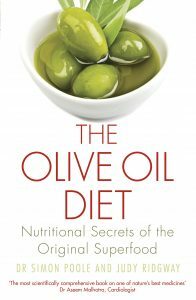 All these recipes could be part of the Olive Oil Diet I advocate in my latest book with co-author Dr. Simon Poole.